Often we are asked by solutions providers, “What should we do next?” It is an incredibly important question and one that has no easy answer. And it is a million—or more—dollar bet for a company to figure that out. Often, when asked this question, I get the recurring imagine of Jules Verne’s Journey to the Center of the Earth,1 since it is a journey fraught with excitement, learning and danger. Another more relevant image or analogy is the dry but critical calculus formula used to find the center of gravity in an object. You can’t stay afloat, fly, or even stand up straight, without understanding the center of gravity and building that into your design. TMS – Does it Have a Center of Gravity? The TMS+2 market is not like the ERP market. ERP has at its core—or center of gravity—the accounting system that is consistent across every industry that ERP serves. Every module—sales, manufacturing,3 etc.—of the ERP can be expressed in terms of the financial value. It can also be integrated, rolling up sales, costs and so on to the general ledger. TMS+ is different. 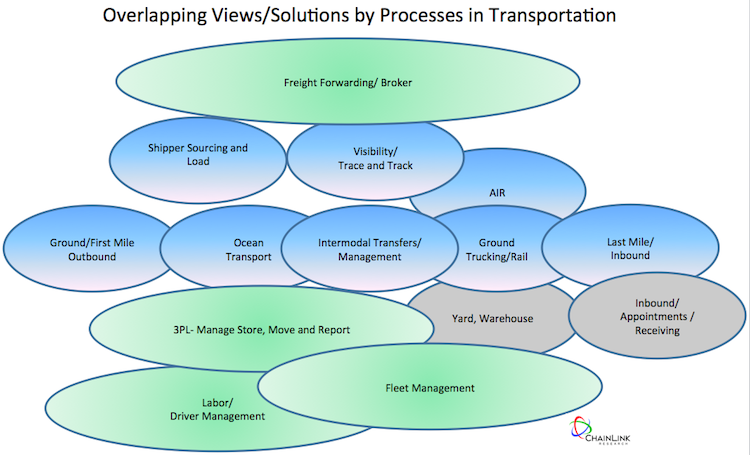 An analysis of the history of the transporation software market reveals that the TMS+ companies got their start serving different entities and different aspects of the transportation problems they faced. Examples are: designing a route for a truck; vs. scheduling and optimizing berth space at a port; vs. assuring you are not shipping a product to a company on the denied parties list; and also that you have all the great paperwork needed for market entry. I picked these extremes because even at the center, they do have a few things in common. Somewhere at the source of all that activity is a shipper or consignee whose freight is being transported—which is the whole purpose of the effort. They may like to know if this and every other activity on the journey is happening according to plan. These examples also have some other attributes in common, such as the underlying scheduling optimization math (that allows for finding the best times, locations, shortest distances), managing various documents, and so on. It takes a long time to develop software. Understand your customer. TMS+ vendors are often challenged since their customers are technology- or functionally-focused. Customers think in terms of expeditiously getting the job done. That is good. So they can identify a decent solution for themselves. However, they often don’t take time to think about their greater needs. So the TMS+ software industry has frequently been responsible for helping the customer discover those needs. We call that “thought leadership.” The tech providers have often led the initiative to find a better way of doing things. Archimedes developed many of his math formulas by close observation of the physical properties of things—the world. He helped design better carts and chariots. But of course, he did not use these too much, unlike the merchants, soldiers and general population. And thus the center of gravity: Who do you serve? What are their needs? Defining the center of gravity begins the journey to the center with a better understanding of the broader needs of the customer—and what they need to do next to find out what the software or service should do next. More to come on the Transportation market in our next issue.